Our Hoot-BNR, available in 600 and 1,000 GPD sizes, is used for replacement and new constriction in the Nitrogen sensitive areas of the Bay Restoration area of Maryland. The Hoot-BNR was one of the 4 original Best Available Technologies (BAT) to be approved and is field verified to reduce nitrogen in by 64% or 21 mg/L. The Hoot-BNR is available for funding under the Bay Restoration Program and for area’s of new construction, and also outside of the immediate area where advanced levels of treatment are required on for all technologies. Our Hoot-ANR, available in a 450 GPD size is currently approved and listed as an NSF 245 Nitrogen Reduction unit and is the first tested technology to achieve below 10 mg/L, the Federal standard for Nitrogen in Drinking water. Test Center data shows a greater than 85% reduction, or 5.8 mg/L. The Hoot-ANR is available for funding under the Bay Restoration Program and for area’s of new construction, and also outside of the immediate area where advanced levels of treatment are required on for all technologies. The following documents are available for use to design and seek approval for systems in Maryland. For prints on tanks or individual components, please see the Drawings tab. The following documents are available for use to design and seek approval for systems in Maryland. *Please note that this tank requires an additional pre-treatment tank to make it a complete system. Designers and Engineers may request a copy of the AutoCAD drawings for the above prints. These improvements to the major contributors of pollution to the bay have increased Septic Systems role from as little as 4% in the early 80’s to as much as 11% today. 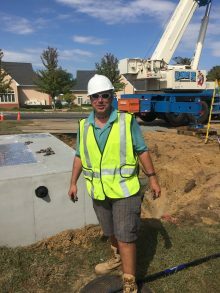 Now septic systems are being regulated and those that influence the bay in either new construction, or in the case of failing systems, replacement systems, and improvements must meet nitrogen reductions of at least 50%. Funding for the treatment equipment is being provided to demonstrate the effectiveness of these technologies.